By using social media, storytelling and the arts to convey messages about social justice and civic duty, students are bypassing more traditional routes to civic participation and capitalizing on their ability to reach a global audience via one click. NYSSBA’s latest report, We Hold These Tweets to Be Self-Evident, illustrates how teens are navigating this new type of civic engagement and how schools may just need to play a little catch up. Of Sound Mind: Do schools have enough mental health support staff to meet student need? This report, a collaborative effort between the New York State School Boards Association and the New York Association of School Psychologists, examines whether there are enough qualified school psychologists in New York State to meet student need. It also explores regional disparities and offers recommendations for school leaders and state policymakers to address these challenges. NYSSBA’s new Q&A helps school board members, administrators and teachers understand how to reconcile helicopter parenting with school-family engagement. School Safety Reference Guide: A quick guide to responsibilites under State law. NYSSBA’s new reference guide highlights the school safety plan requirements and roles and responsibilities required by New York State law – presented in a Q&A format. We hope you find this guide to be a valuable quick reference. Climate change is one hot topic. 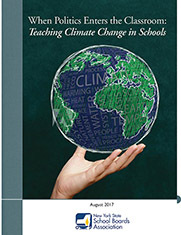 Learn why that is -- and what educators can do to teach it effectively -- in NYSSBA’s latest research report, When Politics Enters the Classroom: Teaching Climate Change in Schools. 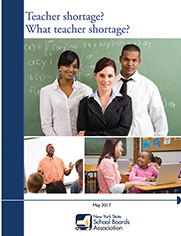 The report provides a political and economic context to an often divisive subject and offers school leaders and educators pedagogical and professional development best practices. 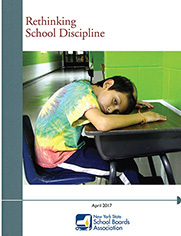 School discipline reform often focuses on the use of restorative justice, a disciplinary approach that emphasizes student accountability for behavior and relationship-building. NYSSBA’s latest report, Rethinking School Discipline, taps into the attraction of restorative justice, explains how it is implemented in schools, assesses its outcomes, and offers school board members, administrators and educators best practices for school district implementation. Community Schools: The Great Equalizer? Community schools can help students overcome the adverse effects of poverty and other obstacles to success. 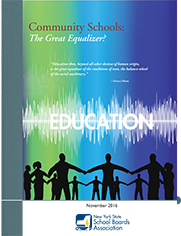 NYSSBA’s latest research report offers an in-depth view of community schools, including a glimpse at life inside two community schools. Learn how community schools work, available funding sources, and the importance of community partnerships. 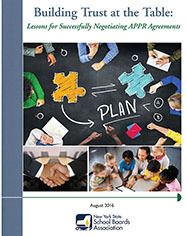 NYSSBA's new research report offers an inside look at the state of APPR, offered by those on the front lines of negotiations, as well as key takeaways for districts negotiating APPR plans.